I hate to say it, but soon school will be in full swing. Goodbye, late nights, Netflix and freedom. Hello, early mornings, textbooks, and crowded hallways. Armed with backpacks, and lunch bags we will take the first walk of many towards our designated education establishment. Soon, the world will hear the collective groan of students everywhere at the sound of their alarm clocks. 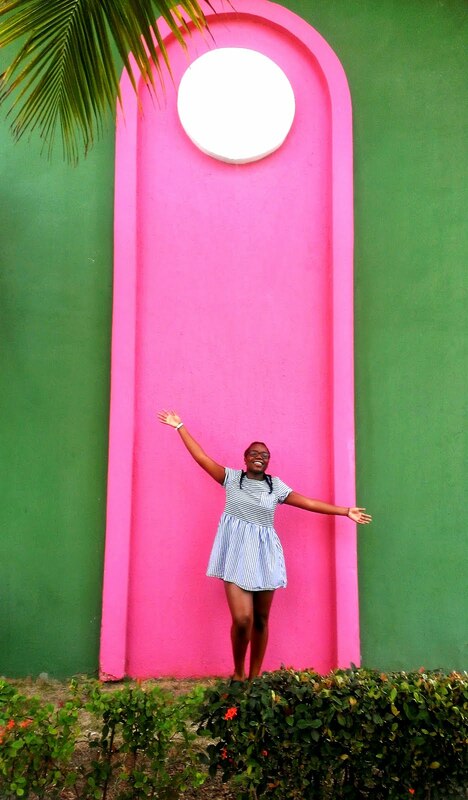 And then the chorus of sighs as the first school bell of the year rings. Besides seeing my friends, the only thing I look forward to around this time of year is the new back-to-school merchandise. I love going to Staples or Indigo and walking through the aisles full of cute notebooks, even cuter pencil cases, and other organizational office supplies. My number one way to motivate myself towards actually enjoying the new year is by decorating. Although the work we have to do may not be fun, it doesn't mean that everything else doesn't have to be! I decorate and personalize almost everything in my desk area so that I actually look forward to using it. So to trick yourself into actually looking forward to heading back, here are ways to add a little pep to your back-to-school prep! I am obsessed with planners and agendas. But since I have qualms about buying a book that I won't ever reuse once the year is up, I've decided to create my own DIY Life Planner. 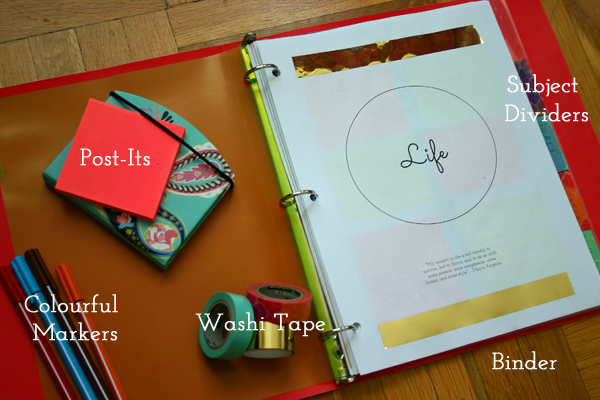 Drawing inspiration from Jill Cimorelli's YouTube video, "DIY: Life Binder! Organize your Calendar, Work, School +MORE!" I personalized this $4 dollar binder using washi tape, markers, post-its and special templates to help keep myself visually organized throughout the new school year. Stay tuned for how I made this chalkboard. Besides the regular calendar, I like to have a monthly overview of what needs to be done. The bigger, the bolder, the better it is for me to remember what needs to be done. 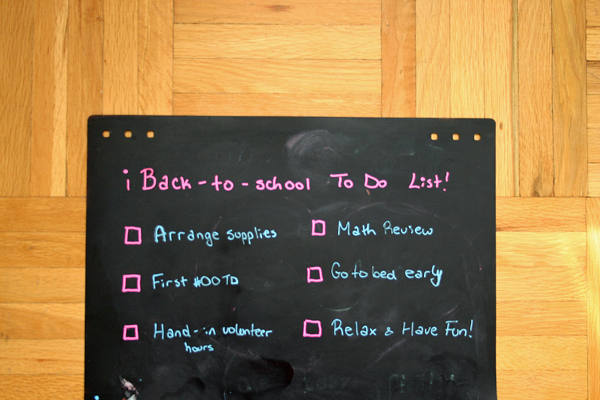 By having my memos on a chalkboard, it makes it more fun to use and creates a contrast against all of my brighter colored furniture. This way it is harder for important dates or goals to sneak up on me, therefore relieving stress and increasing productivity. 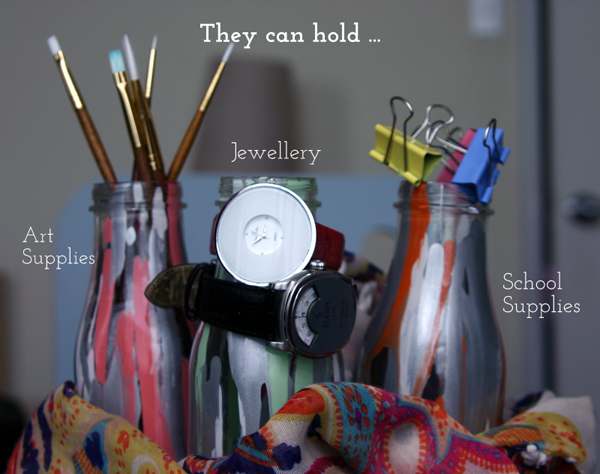 Click here to find out more on how I made these bottle holders. Albert Einstein once said, "If a cluttered desk is a sign of a cluttered mind, of what, then, is an empty desk a sign?” So based on this theory, a brightly colored desk should produce a very bright individual. When my desk is messy, all I can do is sit and let the anxiety build as I try to simultaneously ignore the chaos around me and successfully finish my work. So, I like to stash my less aesthetically pleasing supplies in nice-looking containers such as these DIY bottles (shown above), old shopping bags (the paper ones) and patterned baskets. This adds a nice touch to your workspace while keeping everything neat and tidy. There is nothing like having constant inspiration where you go. 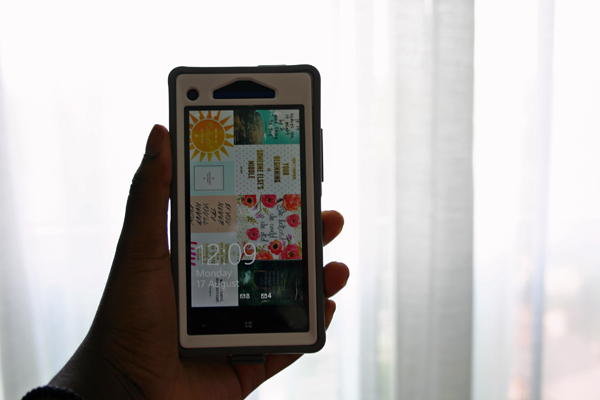 Like most people, a nice lock screen is an essential step in their phone's personalization process. I like to take it up a notch, by making a collage for my phone and my laptop. I made this collage using pictures I found on my Pinterest, but I have created FREE laptop screensaver (right click and hit save as to download) to keep you motivated even on your down time. 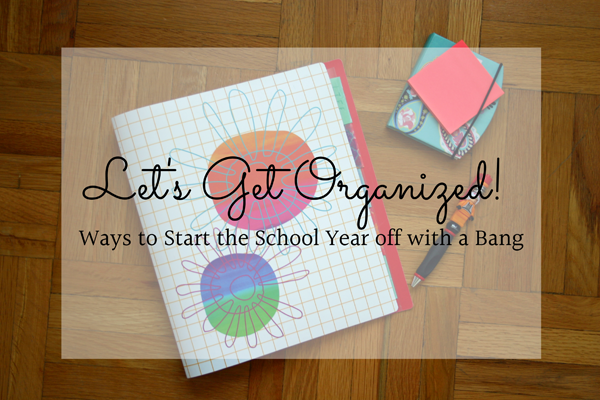 I hope that after trying a few of these tips that you feel ready to tackle the new school year with style, ease and a whole lot of organization. but this post is certainly helpful for when I finally accept it!